An Interview With Isaac 'Dr Size' Nesser. Dr. Size has the worlds largest muscular chest and arms. Find out how he got so massive in this interview by Paul Becker. Isaac "Dr Size" Nesser has the worlds largest muscular chest and arms in the world, according to The Guinness Book of World Records! 74 inch chest, 29 arms, he weighs 362lbs, bench presses 825lbs and he is completely drug free. He would like to get the word out to as many people as he can, that it's possible to achieve great things without drugs. [ Q ] Isaac, you have the world's largest muscular chest (over 74") and arms (29"). You have bench pressed over 800 pounds. Could you tell us some more about your feats of strength? Isaac: I've benched 820lbs. I work out with barbell curls up to 315 lbs for 5 reps. Not a so-called cheat curl either. I do one-arm tricep extensions with up to 180lbs. I've lifted truck engines over 700lbs and carried them. Lifted and carried 500lbs stones. Lifted station wagons off the ground with my back in the front where the engine is. Carried 100-gallon drums filled with gas. Those are just a few feats of strength I've done. [ Q ] When did you set the records? Do you think you can improve upon them? Isaac: Set the records in 1989, and improved upon them in 1994 where they stand now. I don't think I'll be able to improve upon them. It takes a tremendous amount of work to just maintain. And the body can only take so much punishment on the joints and ligaments. [ Q ] You have made it very clear that you do not use and never have used drugs to enhance your performance. Could you tell us more about why you have chosen to remain drug-free? Isaac: I don't believe in using drugs. In my view that is just plain cheating and the easy way out. I've worked too hard to abuse my body with drugs. I have no respect for people who use drugs - champion or no champion. To me using steroids or other muscle enhancing drugs is the same as using heroin or cocaine. Chub To Champion Video Transformation. This article presents Mitch's contest preparation diet, and some special exercises (with video) to help you continue getting lean this summer. The second part of this series will give you more details about his training plus additional video. [ Q ] Do you feel that there have been any disadvantages of remaining drug-free? Do you think you could have improved your performance with drugs? Isaac: No. 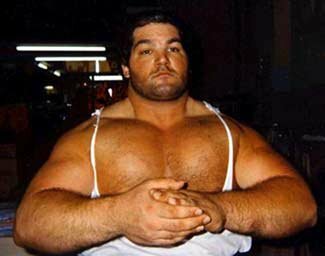 I don't feel there have been any disadvantages in being drug free because I've built the biggest muscles in the world - even getting bigger then any other men who have used the drugs. The only disadvantage, in my view would be, that I've had to lift harder and more and longer hours to achieve my goal. But it is well worth it. [ Q ] Are there people in the strength community that do not believe that you haven't used drugs? If so, how would you respond to them? Isaac: Yes. I believe there are people and lifters who don't believe I haven't used drugs, or I'm as massive as I am. My response is that I workout for myself, against myself. It's immaterial to me what they think. I know I can match anyone in the world in an overall strength contest, and I know I'm bigger than anyone. And if anyone has something to say about it, if they have big enough balls, say it to face. Yes. A lot of people make comparisons, but they shouldn't because every person is unique. No two people alike. One needs to take what they have and develop that to the best of their ability. [ Q ] With your size and strength, you would seem to be a natural for competing in the World's Strongest Man competition. Have you ever been contacted to participate? If "yes," why haven't you accepted? If "no," why do you think that is? Isaac: Yes, I have been contacted to compete in world strongman competitions, and the reasons I didn't were the drugs I believe everyone is using. Not that they would be stronger then me because of it, because they wouldn't, but again because I don't associate myself with people who use drugs. And one competition I was contacted like a week before the event with no time to train for it, or anything. I believe it was done intentionally that way. Don't get me wrong. If there are some competitors out there that are drug free, and accomplished their size and strength naturally, I have all the respect in the world for them. It takes a lot of hard, hard work, and I say "more power to them." [ Q ] If you were to enter the WSM competition this year, how do you think you would do? How do you think you would do if there were drug testing? Isaac: If I entered, there is no doubt in my mind I would win - unless of course there were some unforeseen things like an injury. [ Q ] To what do you credit your tremendous size? Genetics? Hard work? Good eating? All of the above? Isaac: I credit my massive size to very, very hard work. I've been working out for almost 30 years now with weight, from 4 to 6 hours a day, not missing more then one consecutive week at anytime during that period. One week was the longest time I didn't work out, and it was because of a bad bout with the flu. Yes, some genetics are involved, only to a certain extent. I was not a bony kid, but was not husky - just built average. Also, good living, getting my rest, and very little late night outs, and staying away from any types of drugs. [ Q ] You have said that you started lifting when you were eight years old. There was a fifteen-year period where you worked out for five to six hours per day. Now, you're at four hours a day. How do you find the time to do this? What sacrifices have you had to make? Isaac: Yes, I work out for long hours, and I also own 2 businesses, so I do sacrifice. Usually I workout at night, between 6 and 10. The biggest sacrifice is probably my social and personal life. I find time for it, but never enough. [ Q ] Could you give us some detail on your training routine? Isaac: Well, I have a unique training regimen, Most so called "experts" would say to work on one muscle part one day, and then rest it the next. Well, what has worked for me is lifting on the same muscle parts, for 8 to 10 days straight, then taking 2 or 3 days off for the muscle to heal and grow. I believe in working the muscle really hard for days, then letting them rest afterwards. Now I caution to young people reading this, just because this works for me, doesn't me it's right for you. Everyone needs to go through a trial and error process with routines to see what their body best responds to. [ Q ] A lot of the the subscribers to this newsletter are young and just getting started in lifting. If you had to give them three pieces of advice, what would they be? Isaac: To start out slow, and to find out what your body responds to. Just because one person is doing a certain routine, doesn't mean it will work for you too. One needs to try different routines to see what their body best responds to! And always use good form. Using bad form can cause injury. And never try to lift heavier weights then you can handle to try to impress someone. That can only lead to injury and humiliation. [ Q ] Is there anything else you would like to say? Isaac: I think a common mistake a lot of people make is comparing themselves to others. One needs to understand everyone is unique. No one looks exactly like you in the World. One strives for uniqueness but forgets they already possess that. Take what you have and develop it to the best of your ability and you're already a winner! I also want to let other athletes know if they are drug free, they get all my respect and admiration for working hard and getting where they want to be. More power to all of you!! If you have any questions or comments feel free to e-mail me at muscle@relaypoint.net. Be Sure To Visit My Website At www.trulyhuge.com. Paul Becker of Trulyhuge.com. Tons of great articles!